The Analytics Portal contains reports that can be accessed by Account Administrators on the AT&T Office@Hand Online account. This feature is available to all Office Standard, Premium, and Enterprise Edition Users. However, the Device Status Report can only be accessed by Enterprise Edition Users. 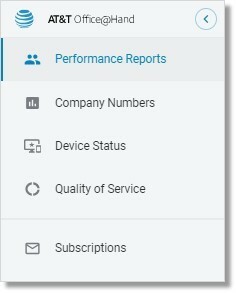 The Analytics Portal will be the new interface for accessing new reports (Call Activity report, Device Status report) and existing reports such as Historical reports, QoS, and Live Reports. The Analytics Portal is available to all AT&T Office@Hand Office Standard, Premium, and Enterprise Edition Users, and can be accessed on the Office@Hand Online account. However, the Device Status Report (Reports > Analytics Portal > Phones & Devices) can only be accessed by Enterprise Edition Users. Chrome, Firefox, Safari, and Edge. The Analytics Portal can be accessed by Account Administrators on the AT&T Office@Hand Online account by going to Admin Portal > Reports > Analytics Portal.